On the 4th of July I ran my third Shawsville 5K, a race that has been around for 35 years! It's probably the flattest 5K you can find in the hills of Southwest Virginia. I love this annual local race that starts on a cul-de-sac road, between two driveways (see top photo), and attracts some fast area runners. The top three men were under 17 minutes; the top three women were under 20 minutes. Despite my love of the race, the sound of the rain falling on race morning had me considering my love of my bed and remaining in it. But hey, I didn't spend $5 on a patriotic tank top at Old Navy for nothing!! I thought I was SO amazing for getting out the door to DRIVE to the race, until halfway there when I saw two cyclists up ahead in the steady rain and recognized my friends Kristen and Jordan Chang RIDING to the race. Impressive. 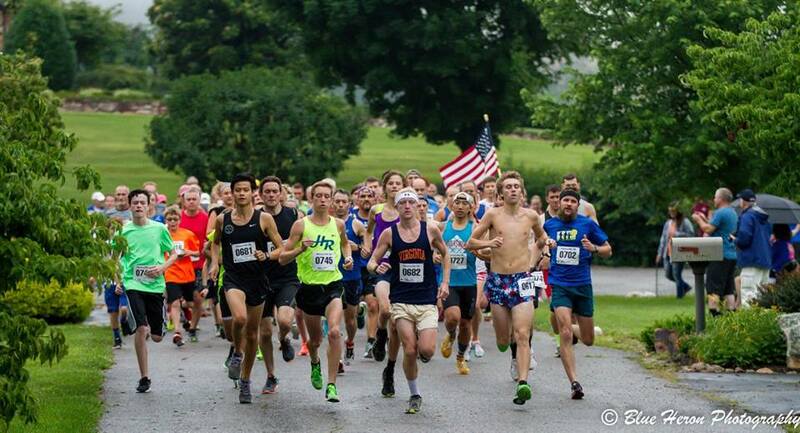 The rain tapered off and we really had nice conditions to race! At the start, I was so surprised (shocked in a "what are you doing here?!" 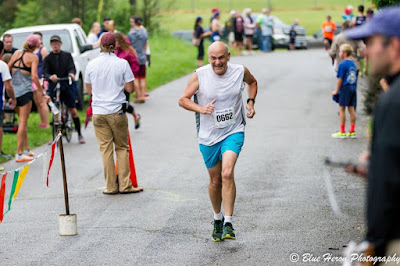 way) to see Michael Casciere (below), a Physical Therapist I worked with early in my running "career" who lives in North Carolina, but was in town and ran this with his granddaughter. He ran for Boston University and had done the Boston Marathon many times. The running world is a small world in many ways! The race always starts with the Pledge of Allegiance and timely words regarding our nation by Coach Marvin Ballard, a history teacher at Eastern Montgomery High School. It always chokes me up! I was really glad I ventured out into the rainy morning, thanks to a little extra motivation in the form of a tank top! 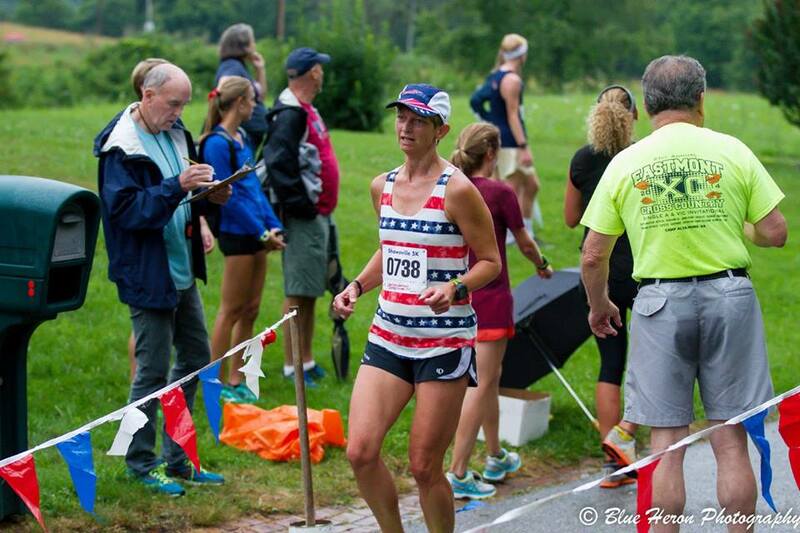 photo by Blue Heron Photography; Coach Ballard in the yellow shirt at the finish line. 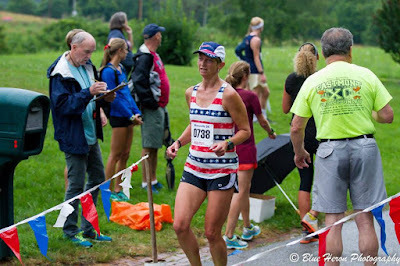 My Custom Kit journey with Pearl Izumi!